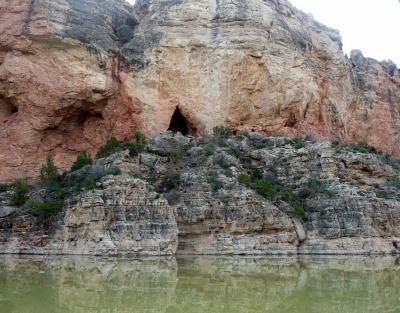 Launch: Barry's Landing, in Montana, on the western side of the canyon, about in the middle of the gorge. Launching here gives access, in either direction, to each half of the canyon. 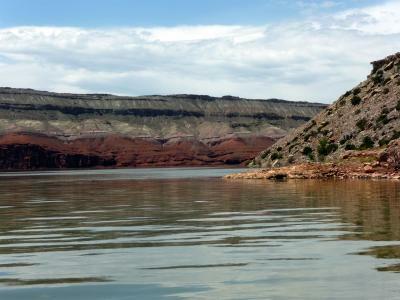 Nearby campsites: There is a nice federal campsite near Barry's Landing and Black Canyon Boat-in Campground has sites, tables and floating vault restrooms. 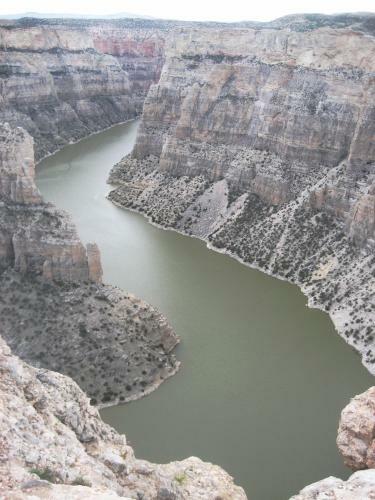 Comments: This wild and scenic canyon of the Bighorn River is divided between Montana and Wyoming. For 55 miles the river has sliced a deep gorge through resistant limestone beds. 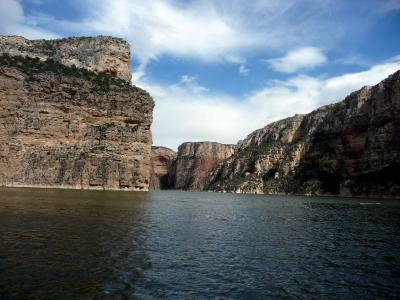 Following construction of Yellowtail Dam, a 71 mile lake backed up through the canyon. 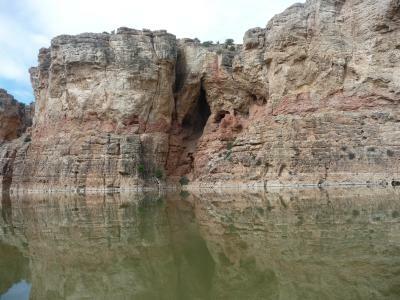 Bighorn Canyon National Recreation Area was created in 1966 to manage and protect this magnificent national treasure. 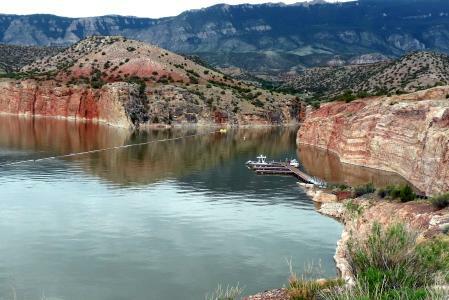 For those who enjoy boating surrounded by wilderness beauty, this is a fine experience. ----There is a steep grade down to the ramp at Barry's Landing. Some folks backed their trailer and boat down all the way. We found we could turn at the bottom of the grade and then back into the water. There are a few docks beside the ramp. 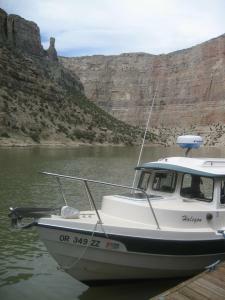 ----We had just completed launching into Bighorn Lake when El spotted movement among the rocks on the opposite shore. "Look! There are the Bighorns!" 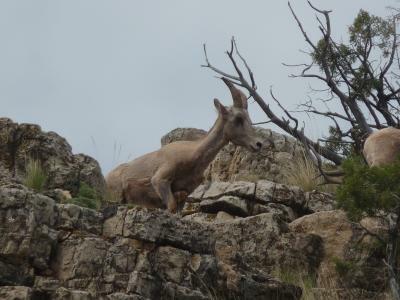 ----And sure enough, there they were - in Bighorn Canyon! --------We watched them for a long time, amazed at their dexterity jumping between steeply pitched rock ledges. Young ones seemed as adept as their parents. 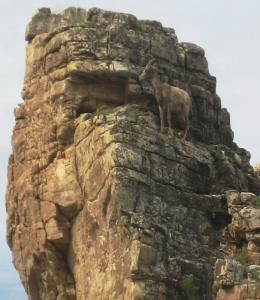 ----For many years, the bighorn had disappeared from the canyon. 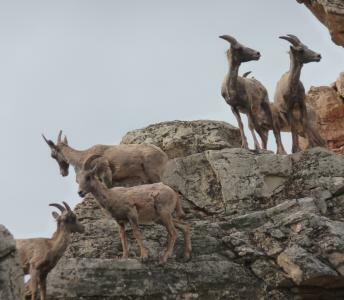 The last bighorn sheep was seen in this region in the 1800's. 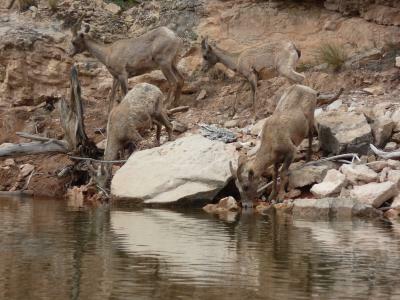 Then, Montana and Wyoming Fish and Game reintroduced bighorns to the area in the 1970's. 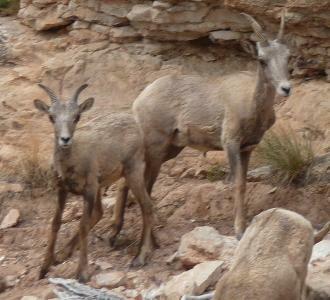 Descendants of those sheep migrated into the canyon. The population today is estimated between 150 to 200. 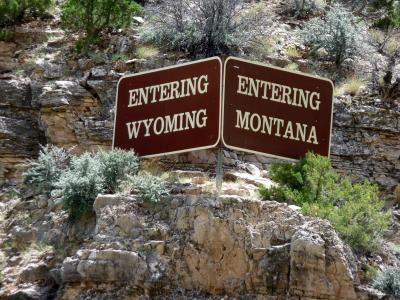 From the launch ramp, a turn one way and you will be in Wyoming and a turn in the opposite direction and you will soon be in Montana - and the canyon looks much the same either way - silent, towering, beautiful. ----One is surrounded (enclosed?) and perhaps a bit overwhelmed by geology when cruising this deep cut through the crust. Your cruise will be more interesting, perhaps, with a little understanding of the stories whispered from those canyon walls. ----Exposed in the walls are layers of rock deposited in, or along the shores, of an ancient shallow sea that flooded over the continent from about 500 million years ago until about 250 million years ago. The carbonate walls, interbedded with some shale and sandstone, contain many shells left behind by marine animals. In some places the walls tower over 2,000 feet above the river. ----About 70 million years ago continental collisions to the west exerted pressure on the crust and forced up the Bighorn Mountains. 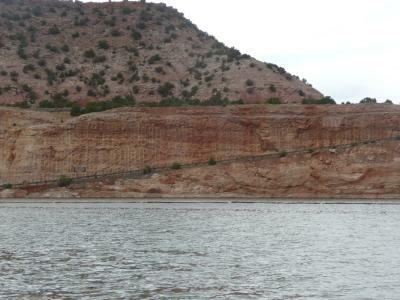 Large volumes of sediment eroded off the Uplift to be deposited in surrounding basins. These may be seen today as one leaves the canyon to the south in Wyoming as tilted red shales and light-colored sandstones. ----And those caves and overhangs along the canyon walls? What secrets do they hold? ----Many of the shelters have been there since before the last Ice Age. Back in the cold times, megafauna lived in the the Bighorn country - and they hung out in those caves for shelter. Paleontologists have extracted bones from those caves. And, those big fellas left some large piles of excrement. Geologists call these fossil dung heaps coprolites. (How's that for a nice name to use next time you hit your finger?) 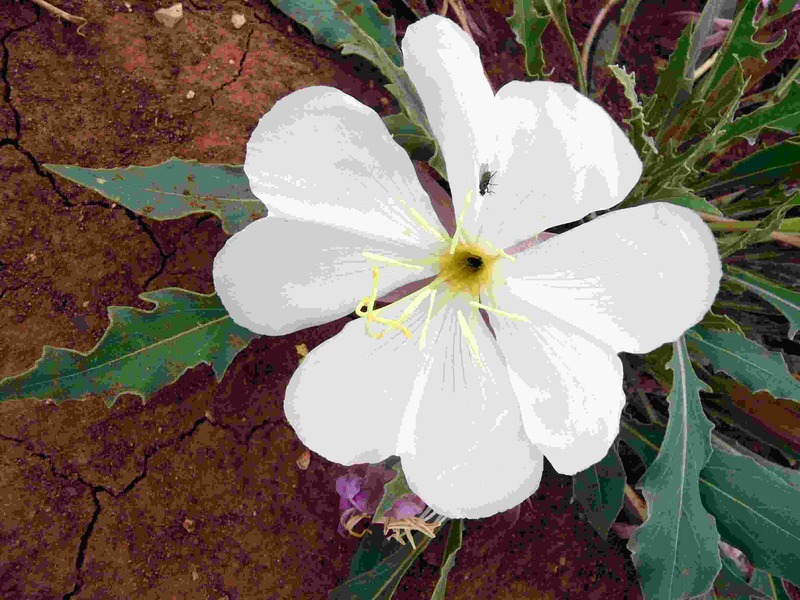 Some even study them under microscopes to identify the pollen in the coprolite. Great way to figure out what the extinct old-timers had for lunch (and, coincidently, what vegetation types existed in the environment in those early post-glacial times). ----Each cruise is a chapter of life. Each short story shares the discovery of beginning, familiarity with experience, and the satisfaction of a happy ending. 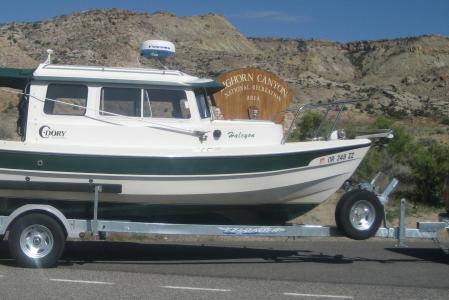 At the completion of our cruise in Bighorn Canyon, Halcyon (and her occupants) was on the road heading nor'easterly to the next chapter. ----But this time we had some company at the beginning of the trail. 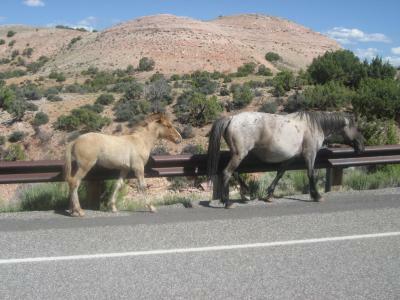 We were in the Pryor Wild Horse Refuge and sure enough - there they were - we were heading down the road together. -----WWe have fond memories of the mustang, Liberty Lady, our daughter rode and grew up with in Nevada. That little horse could outwalk any thorobred, never wore shoes, and she knew her way through the desert when they took long rides.